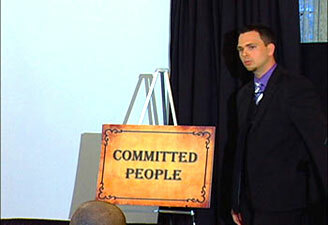 Ontario Keynote speaker and entertainer, Aaron Paterson appears on national television in Japan. When Japan's national television station, TV Asahi was looking to produce a program featuring some of the top magicians from around the world performing their signature routines, Ontario keynote speaker and entertainer, Aaron Paterson was one of the first magicians they approached. Aaron was not only able to provide TV Asahi with magic that would look great on television, he was able to seemingly "read the minds" of their studio audience, their guest host, as well as the hundreds of thousands of people watching from home. 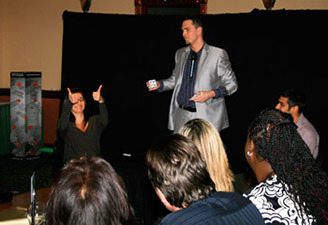 The program received strong ratings and included magicians from the United States, The Netherlands, Germany, France, Japan, Belgium and the list goes on. 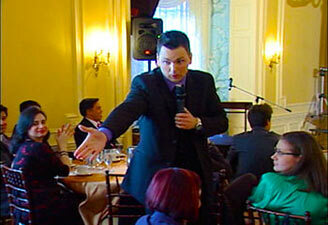 It was an honor for Aaron as he was the only Canadian magician and illusionist featured on the program. Aaron Paterson has once again solidified his status as a world class entertainer. Aaron would like to extend his heart felt sympathies to the people of Japan in the wake of the earthquake/tsunami that adversely effected so many. Worldwide leader in the Ingredient Manufacturing sector, Puratos commissions keynote speaker from Ontario, Aaron Paterson to use his magic to relay key messages to their management team at their recent conference. At their recent re-branding conference in Ontario, Puratos, world leader in the ingredient manufacturing sector, brought in keynote speaker, Aaron Paterson to relay key messages while entertaining their employees. Participating in the event, were management from all over the globe. Aaron was able to read people's thoughts, cause borrowed objects to "vanish" and appear in the strangest locations, as well as cause one of the Puratos management team to actually "levitate" in mid-air. Aaron was happy to work with Puratos to ensure that their objectives were met and looks forward to the potential of working with them on future projects. Aaron Paterson - Keynote Speaker Ontario Canada! One of the leading engineering and construction firms in the world, SNC - Lavalin invited keynote speaker and entertainer Aaron Paterson to entertain at a recent employee event. 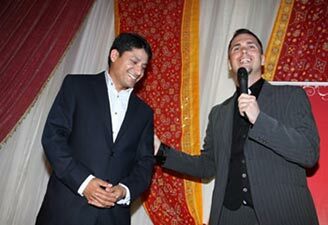 The Mississauga Convention Center was recently host to some spectacular magic, courtesy of one of the top Corporate Entertainers in Toronto and across Canada for that matter, Aaron Paterson. SNC - Lavalin wanted to thank their employees for a prosperous year and an overall job well done so they brought in Aaron Paterson. Aaron was able to customize his performance to their individual needs and deliver incredible entertainment value for the audience of almost 1000 people. 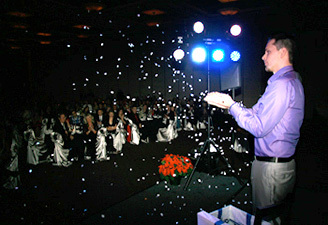 The large audience was captivated as Aaron was able to cause the magic to happen right in their own hands. 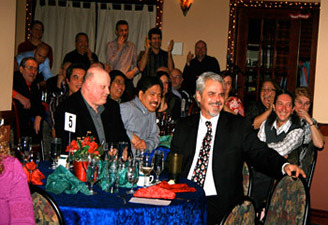 The ability to hold the attention and throughly entertain an audience of close to 1000 is truly the mark of an experienced professional entertainer. Aaron was even able to cause SNC Lavalin's Vice President to magically "appear" on stage as a segue into the speech portion of the evening. Entertainer, Aaron Paterson performs for Exxon Mobil to rave reviews from all in attendance. When Exxon Mobil was looking to bring something special to this years Seasonal Event, they booked keynote speaker and entertainer, Aaron Paterson. 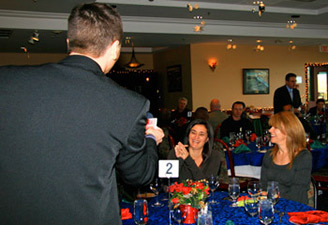 Aaron was able to wow guests with his After-Meal Entertainment, and bring something completely unique and entertaining to this years function. Audience members became the stars of the show as they particpated in some of the most hilarious and unbelievable feats of illusion in the world today. One of the highlights of the performance was when Aaron caused the jacket of a member of Exxon's senior management to "vanish" while being worn, prompting an audible gasp from the audience. 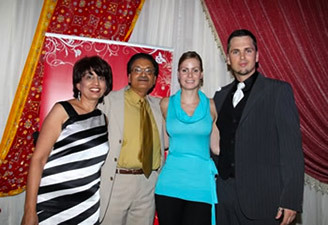 The event once again took place at the beautiful Hilton Suites - Markham Conference Centre and Spa. The staff at the venue were extremely accomodating and an absolute pleasure to work with. 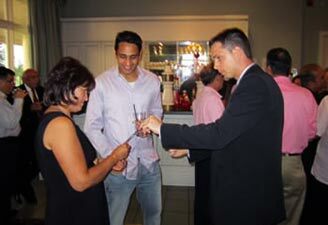 Aaron was happy to stick around afterwords to greet and take photos with guests. CCL Label books Aaron Paterson for their luncheon as a way of showing appreciation to their employees on a job well done. CCL Label wanted to thank their employees for a prosperous year, an immaculate safety record and an overall job well done, so they brought in Aaron Paterson to provide live entertainment for their seasonal event. Aaron was able to deliver with a customized performance that had their employees laughing, applauding and having a great time. 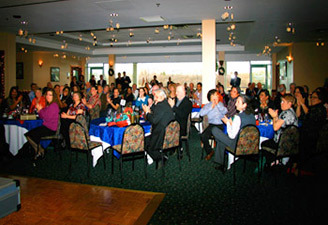 Before a delicious lunch was served courtesy of the Royal Woodbine Golf Club, the venue in which the event took place, Aaron strolled among the guests performing his Cocktail Entertainment, "whetting their appetite" for the After-Meal Entertainment to come after lunch. Employees willingly participated in the performance which made it more relevant to the group as they got to see their peers involved in some incredible demonstrations. The Royal Woodbine Golf Club was extremely accomodating to work with and Aaron would like to thank them for being so helpful. Keynote presenter, Aaron Paterson is booked to headline the Northern Indian Medical and Dental Association of Canada's (NIMDAC's) annual golf tournament. Aaron was commissioned to Headline for the recent NIMDAC, annual golf tournament that took place at Clublink's beautiful Diamond Back Golf Club. 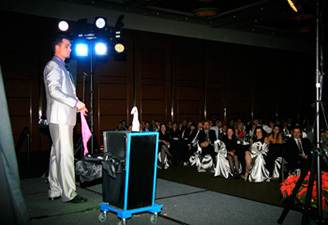 Aaron performed both his Cocktail Entertainment and After-Meal Entertainment and thoroughly entertained Doctors and Dentists from all over Canada. The highlight of the performance was when keynote speaker and entertainer Aaron caused NIMDAC's General Secretary, Dr. Rakesh Kumar to magicially "appear" on stage. 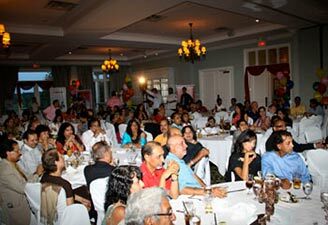 Television personality, Miss Angelie Sood did an incredible job hosting the evening and Aaron appreciated her energetic introduction.